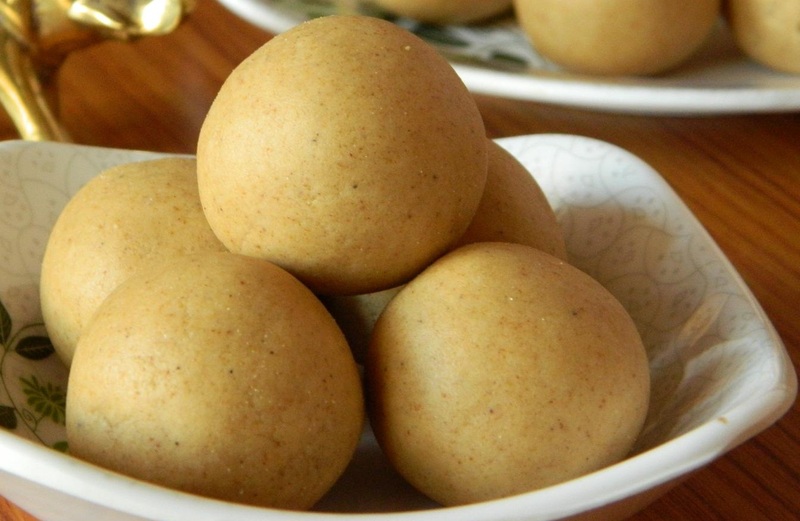 Sunnundallu: Sunnundallu is a classic Andhra sweet made using urad dal that is usually prepared during the festival sankranthi and most other festivals too. Minapappu or Urad Dal is first roasted dry until it turns golden brown and then is sieved. Ground sugar, cardamom seeds, ghee is added and mixed well and then with a handful of butter it is made to a round shape. Dry roast the raw rice in a vessel till a toasty aroma comes out, on low to medium flame. Remove the roasted rice from the heat. Let the roasted rice to cool down to the room temperature. Dry roast de-husked black gram on a low to medium heat, till a toasty aroma comes out from the black gram. Toasting of the black gram takes about 18-20 minutes. Remove the roasted black gram from the heat. Let the roasted black gram to cool down to the room temperature. Blend both roasted rice and roasted black gram to a fine powder. Blend the sugar to a fine powder. Heat ghee till it melts. Mix together rice-black gram powder and powdered sugar in a wide plate. Slowly add hot ghee and keep mixing with hand, till the mix holds together. Shape the mixture into round balls of the size of large lemon. Sunnundallu are ready to be served. Serve the sunnundallu at room temperature. The ghee should be just enough to hold the powders together and not drip while making balls. Sunnundalu can be stored in an air tight container, for at least 2 weeks. Mixture of rice-black gram powder and sugar can be stored in an air tight container for 1-2 months. Whenever required mix melted hot ghee and make sunnundallu. If you have any queries regarding the Sunnundallu recipe, please leave a comment.